Begin by peeling the banana and placing it in a mixing bowl. Add the applesauce and then mash the two together with a fork. When the two substances have combined fairly well, add the oats. Please note, use old-fashioned oats and not quick oats. There is a difference in consistency. Using the same fork, stir the oats and mashed banana and applesauce mixture until just incorporated. Add the white rice flour and mix well. Again, the fork works best. Turn the dough out onto a clean, flat surface like a kitchen counter. Have a scoop of the flour ready on the side. Knead the dough to test whether or not it is ready to cut out. If it sticks to your skin add a bit more flour. Just sprinkle it on top and knead it in. When you've obtained the right consistency, dust your counter top with a nice coating of white rice flour. Place your ball of dough in the middle. Sprinkle some flour on top and rub some along the edges of a rolling pin. Roll the dough into a large circle approximately 1/8 to 1/4 inches in thickness. Preheat your oven to 300 degrees. 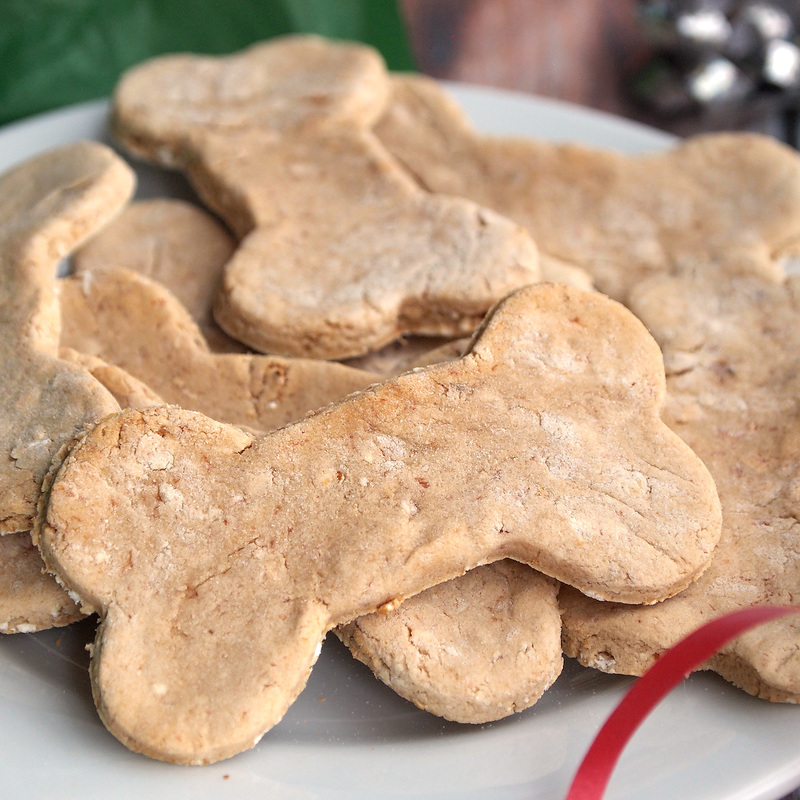 Use a bone shaped cookie cutter to cut out your dog bones. Line a cookie sheet with parchment paper or a silicone liner. Place the cookies onto the cookie sheet and bake for 20 minutes. Remove from the oven and flip the bones. Bake for an additional 20 minutes. When the time is up, turn the oven off and let the cookies cool inside with the door of the oven ajar. When completely cooled, store the bones in an airtight container in the refrigerator for best results. Makes one large cookie sheet full of bones, 12-24 depending on size.